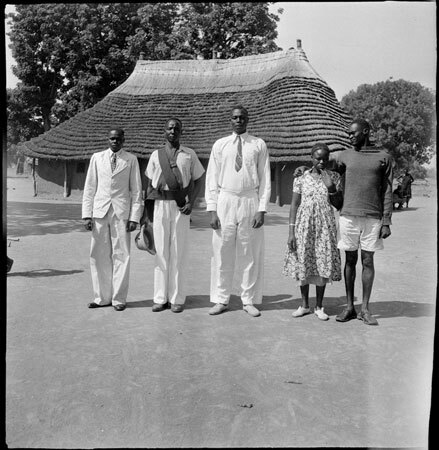 A full length group portrait of four Mandari men and a woman in a European dress, one wearing a light coloured suit, one a dark sash and an SMS pin, indicating that he was employed by the Sudan Medical Service. Morton, Chris. "Mandari colonial employees" Southern Sudan Project (in development). 03 Jan. 2006. Pitt Rivers Museum. <http://southernsudan.prm.ox.ac.uk/details/1998.97.206/>.